I recently started listening to a podcast called Out of the Ordinary. It’s produced by two friends, Lisa-Jo Baker and Christie Purifoy. Each week they talk about the ordinary things of life, which when they talk about it, seem really quite special. I always feel like I’m part of the conversation and end up laughing along with their antics and tearing up at their sweet stories. The first show I listened to was called, “An Easy Way to Reset Your Day.” Lisa-Jo grew up in South Africa and in this podcast talked about the joy of sitting down to a cup of tea. 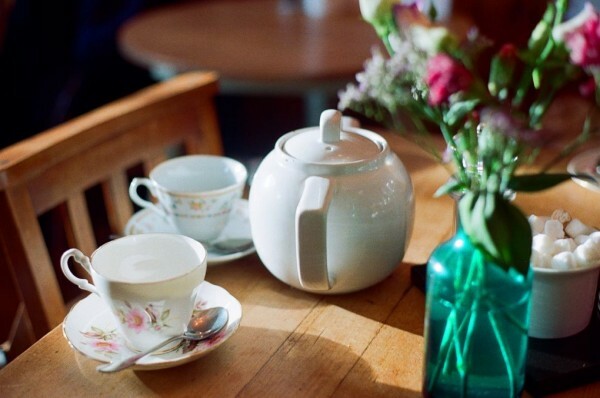 As I listened to Lisa-Jo and Christie talk about how a simple cup of tea might actually be just the break you need to jump-start the rest of your day, a flood of memories revolving around tea came back to me. Lisa-Jo talked about how growing up she always put milk in her tea, which reminded me of my friend, Betsy. It was Betsy who taught me to put milk in my tea. She claimed it’s just better that way. Every time I would visit Betsy, she’d always offer me some tea, with milk, to drink as we chatted. She passed away several years ago but even the very last time I saw her, just days before she stepped into Glory, she asked if I’d like some tea. Lisa-Jo also talked about the sugar cubes they’d use for their tea. No wonder she liked tea so much! The talk of sugar cubes reminded me of all the times I went to visit my grandparents in Kansas City when I was a kids. They would take me out to eat and, at that time (in the late ‘60’s) many of the restaurants had sugar cubes on the table for people to use in their tea or coffee. Often the cubes were wrapped in paper, which seemed to make them all the more exotic. And, my grandmother allowed me to literally eat sugar cubes straight up out of their paper wrappers! It is the best of memories but definitely not one I want to recreate with my own grandkids—especially when I’m the one left to deal with the consequent sugar high! Almost every time I make, or see, herbal tea I think back to the time my mom had some friends over for tea. Her friend, Day, had just been diagnosed with some health problems and the doctor told her she should quit drinking coffee, and start drinking herbal tea (again, in the late ’60’s—I’m not sure if that medical advice still holds). She’d brought her own tea bag but my mom was brewing it for her. Having never made herbal tea, my mom asked her if the tea was supposed to turn a darker color and Day responded with, “No, it always looks pretty much like urine.” It’s really hard for me to make herbal tea without thinking of Day . . . and laughing. None of these memories are extraordinary; they’re just simple memories with people I loved. In this age of social media, I wonder if we’re missing out on memories like this? Is the “break” in our day a time where we scroll through Instagram for a few minutes, or is it a time we really connect with another human? Don’t get me wrong, I’m not pointing fingers here, I do my fair share of scrolling. But, I do miss the one on one connection with friends that used to be so common. Wouldn’t it be nice to start making some for tea—maybe with a little milk and a sugar cube or two. Because, it’s in the sharing of everyday joys that we connect and are changed. Your blogs always brighten my day. I rarely drink tea, but will think of you next time I do. I don’t really drink tea all that much, either, Lois. Except in the summer when I drink a lot of iced tea. Thanks for reading, Lois!